At issue: A photographer who won First Place in the Washington Trails association’s annual photo contest may have hopped over a low wall near the Johnson Ridge Observatory (pictured above) at Mount St. Helens and walked through a field of wildflowers to get the winning shot. The above shot is not the winning photo, rather an image from former Spokesman-Review photographer Christopher Anderson taken nearly 10 years ago. Fields of Indian paintbrush fill the foreground. Mount St. Helens, pockets of snow still visible in the soft glow of a summer sunset, anchors the entire scene. Clouds stretch into the distance drawing the viewer fully into the photo. It’s a beautifully composed and executed landscape. And it won first place in the trailscape category in the Washington Trails Association’s annual photo contest. The photo will appear in the WTA’s January and February magazine and on its 2019 calendar. The photographer, who did not respond to a request for comment, may have jumped a wall, ignored a sign and trekked into a field of protected wildflowers. The issue was first noticed, and flagged by Spokane photographer Craig Goodwin (see his essay). Goodwin is confident the photo was taken from a closed area of Mount St. Helens, one that’s visibly marked by signs and a small wall. He first explained his reasoning in a blog post. 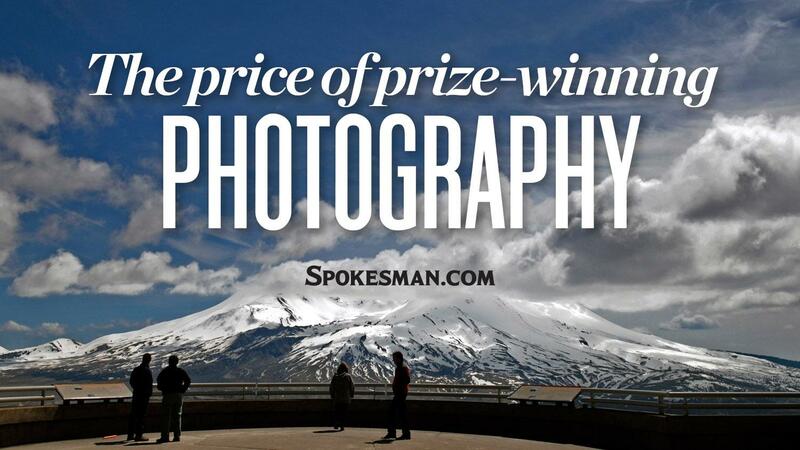 Chelsea Muise, the recreation program manager for Mount St. Helens National Volcanic Monument, has seen the winning photo but can’t be sure from where it was taken. She said it’s not uncommon for people to ignore trail signs and area closures. “Going off trail can impact some of the major research projects going on, plus it ruins the experience for other visitors,” she said. Goodwin entered his photography into this year’s WTA contest and has won in the past. He recognizes his complaint may be seen as the mumblings of a sore loser. Organizers of photo contests have no obligation to ensure the photos are being taken legally, said Michael Van Tubergen, an attorney who works for POMA and other outdoor media clients. “I would say that the organization doesn’t have any legal obligations, but there are probably some ethical obligations,” he said. Photography is generally protected by First Amendment rights, even if the creator of the image trespassed to take the photo. That principle was upheld in 2018 when a federal appeals court ruled that Idaho’s so-called “ag-gag” law, which banned spying at farms, violated free speech rights. Still, Bynum believes organizations that host photo contests have an ethical obligation. Ramos points out that WTA receives roughly 8,000 photos in each contest. They flag and disqualify ones that are clearly taken unethically or illegally. Per their photo contest rules, all photographers are expected to follow Leave No Trace guidelines. The only other contest rule is that the photo must be taken in Washington. “We catch a lot of tents in meadows and too close to animals,” she said. But there is no good system for vetting photos that aren’t clearly violating Leave No Trace principals. “There is an element of taking photographers at their word,” she said. That’s understandable, Bynum said, especially for an organization such as WTA which is largely volunteer-driven and relatively small. Still, he thinks a higher standard must be upheld. He said one way of dealing with the issue would be to carefully vet any photos that make it into the final round of judging. That could include calling the photographer and asking them questions about where and how the photo was taken. The issues aren’t limited only to photo contests. Instagram-obsessed photographers have trespassed on private property, tromped through delicate areas of Yellowstone National Park and fallen to their death from a Yosemite National Park cliff. Locally, people have allowed mountain goats on Scotchman Peak to lick the salt off their skin, said Kiira Siitari, the Coeur d’Alene-based spokeswoman for the Idaho Department of Fish and Game. Last summer, a selfie of a goat licking the face of a Post Falls man went viral on a local Facebook page. Although no one has been seriously hurt on Scotchman Peak, Siitari points to other deadly incidents in which goats have gored and killed hikers. “Approaching wildlife is super dangerous,” she said. That photo-driven disregard isn’t dangerous just for people. In 2017, Outside Magazine reported on how Instagram, and social media in general, have driven overuse of particular spots leading to damaged ecosystems and disrupted habitats. In an interview from last summer, Carly Reed, the Okanogan-Wenatchee National Forest wilderness manager, said Instagram has fueled overuse in the Alpine Lakes area. “You don’t have to go the place that your 15 friends put on Instagram,” Reed said. Just this week, the popular climbing and yoga brand Prana published a photo in its seasonal catalog of professional climber Chris Sharma climbing a fragile cave formation. The National Speleological Society decried the photo, noting the ecological richness of caves and the delicate nature of that habitat, reported Outside Magazine. Chris Celentano is a Coeur d’Alene-based photographer focusing on outdoor photography. Plus, he said, he’s seen too many places wrecked by inconsiderate recreationists. “I have grown tired of seeing some of my favorite ‘secret’ spots get discovered and then quickly ruined by people that do not recognize or care about the damage they may be causing,” he said. As for the WTA contest, Ramos said no changes have been made, but each year WTA staff debrief the previous year’s contest. This issue will be high on their agenda. “I think as more people are discovering the outdoors, we have to really continue to evaluate how we can help hikers protect the places they love,” she said. Published: Feb. 10, 2019, 6 a.m. Updated: Feb. 11, 2019, 2:48 p.m.